This week, Your News to Know rounds up the top stories involving the gold market and the overall economy. Stories include: Why you should buy gold and silver amid overpriced stocks and dollar, five things Trump could say that might send gold soaring, and a bullish case for gold under Trump — even if he fails. Marc Faber isn’t known for his optimistic outlooks: the publisher of The Gloom, Boom & Doom Report has earned the nickname “Dr. Doom” for his oft-apocalyptic predictions. However, gold and silver rank among the rare assets that Faber is excited about, in good part because he views stocks and the dollar as overpriced. “If you look at the valuation of stocks, they’re high. If you look at the valuation of the U.S. dollar, it is high,” Faber explained in a recent interview. Even before his victory last November, Donald Trump’s statements had garnered their share of controversy. Now, anything too bold from Trump could be interpreted by Americans as a sign to flock to safe havens. Nigam Arora, publisher of The Arora Report, dismisses the chance that Trump will take a step back now that he has assumed office, citing many of the president’s recent tweets as proof that the feuding will continue. Arora lists five things that Trump can say that could extend gold’s 11.9% gain since November 8 and send the metal’s prices soaring. The first would be a declaration of China as a currency manipulator due to their recent devaluations of the yuan. The second is confirming the abandonment of the one-China policy, which would strengthen Taiwan while harming Beijing. The third is any statement hinting towards the declaration of artificial islands built by China in the South China Sea as illegal. The fourth catalyst could be further support for other countries to leave the European Union, a position Trump has had no problem taking in the past. The fifth and final thing would be the President’s support for a trade treaty with the United Kingdom, which would encourage to U.K. to do a hard exit from the EU. Recent analysis from Olivier Garret on Forbes presents a bullish case for gold under the Trump administration regardless of its ultimate outcome. As Garret notes, Trump’s best-case scenario has to do with revitalizing money velocity and therefore causing inflation. Money velocity has been on a downwards spiral for 20 years, sinking to record lows after the great recession – Garret explains that recent quantitative easing and drops in interest rates haven’t improved the flow of money in the real economy, which has resulted in over $50 trillion in cash that’s waiting to be used. This lack of money in the economy has many Americans hoping for a Trump reboot: a scenario where the president pours a little (or a lot) of this money into the economy. This would ultimately lead to inflation which, while desired by them, would force the Fed’s hand towards a series of rate hikes. Although rate hikes are generally seen as bad for gold, Garret says the Fed is in no position to hike too fast: with a Federal debt of $20 trillion, a household debt of $14.6 trillion and a business debt of $13.4 trillion, any hiking of rates in the U.S. would need to happen gradually, even if inflation runs hot. This would leave real rates in negative territory, which is exactly the kind of environment that gold prospers from. But what if the Trump administration fails? Garret believes that the headwinds from a strong dollar and increasing deficits would create a global recession, starting in the U.S. and moving on to envelop export-dependent countries like Germany, China and Japan. 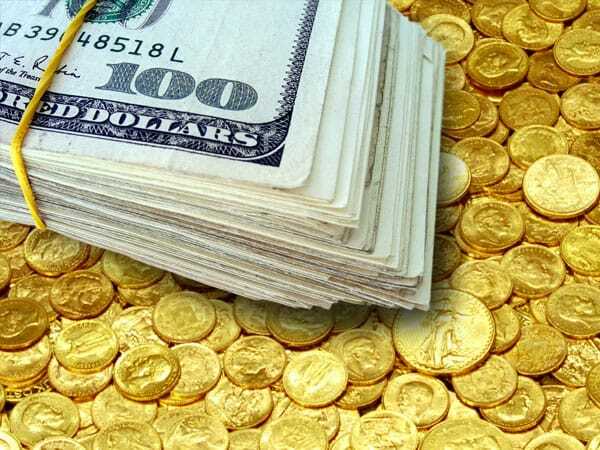 This would lead to more quantitative easing, negative interest rates and currency debasement around the world, all of which would make gold the most appealing asset to have.